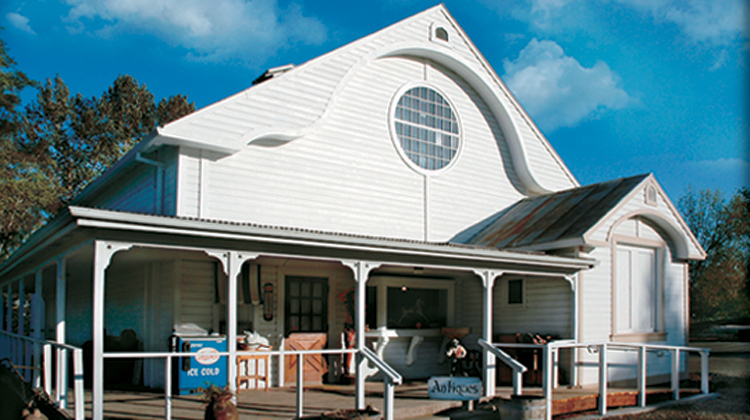 Adjacent to the Butte Creek Mill & Country Store in Eagle Point is an 1895 cheese factory that has been converted to an antique store. The store offers an incredible collection of antiquities including toys, old-fashioned signs, country store materials and much more. Proprietor Bob Russell brought 14 truck loads of handpicked items from his personal collection of 45 years. He traveled extensively throughout the Northwest specializing in collecting the unusual, including an 8-foot wooden barber pole he hauled home at the age of 11. Step back in time while browsing through lots of old drug store memorabilia as well as barber shop collectables. A massive 1880’s oak saloon back bar, from Placerville, CA is complimented by a classic Wurlitzer jukebox. A 12-foot bean counter came from an old store on SE Hawthorne Blvd., and oak cabinets came from a north-east Portland pharmacy. Stop by and stretch your legs along the creek, or tour the Mill and Antique Store. The Antique Store is open 9 a.m. to 5 p.m. daily and is closed on all major holidays.